Utah is home to several world class ski resorts that are blessed with some of the most and best snow you’ll find anywhere. What’s more is most of them are located less than an hour from the airport, Salt Lake City, and one another. The toughest part about choosing to ski in Utah is deciding which resort(s) to visit. Our mountains have many similarities and we honestly don’t think you can go wrong with any of them. Each one has its own unique feel however, so we’ve put together this quick Utah ski resort guide to help you decide which resorts to visit. Probably the most prominent name amongst the Utah resorts, Park City Mountain is also the largest ski resort in North America. Due to its size, its greatest attribute is variety. That means it’s great for a group with skiers of varied abilities and for folks who want to be able to ski for two or three days at the same resort without skiing the same run twice. Park City has also invested heavily in on mountain infrastructure and has a very modern feel. Located next to an idyllic western mountain town which offers endless shopping, dining, and other off mountain activities, Park City is a total package destination. This resort, which is known to be the pinnacle of luxury, only allows skiers. Setting the tone for an excellent ski experience, its customer service, on mountain dining, and beautiful western themed day lodges are a cut above the rest. Deer Valley’s skiing is best known for its perfectly groomed intermediate slopes. High marks for its groomers are well deserved but the ski world often short changes Deer Valley by focusing on this alone. Expert skiers will love the steeps found in Empire Canyon, or the opportunity to test their metal on the 2002 Olympic mogul run. We also find Deer Valley’s tree skiing to be one of the best kept secrets for powder day skiing. This is perhaps the world’s most renowned powder skiing destinations. An average of 500 inches of light fluffy snow a year blanket Alta’s steep slopes. Equally as prominent as its abundance of snow is its no frills, all about the skiing, throwback character. Alta has, and continues to invest in modern infrastructure such as high speed lifts, but you won’t find the abundance of over-the-top luxury lodging and dining that infests the rest of America’s big-name ski resorts. This is exactly why Alta’s fans love it. The terrain is known to be steep and challenging, but there are plenty of moderate groomed options for intermediates to enjoy. 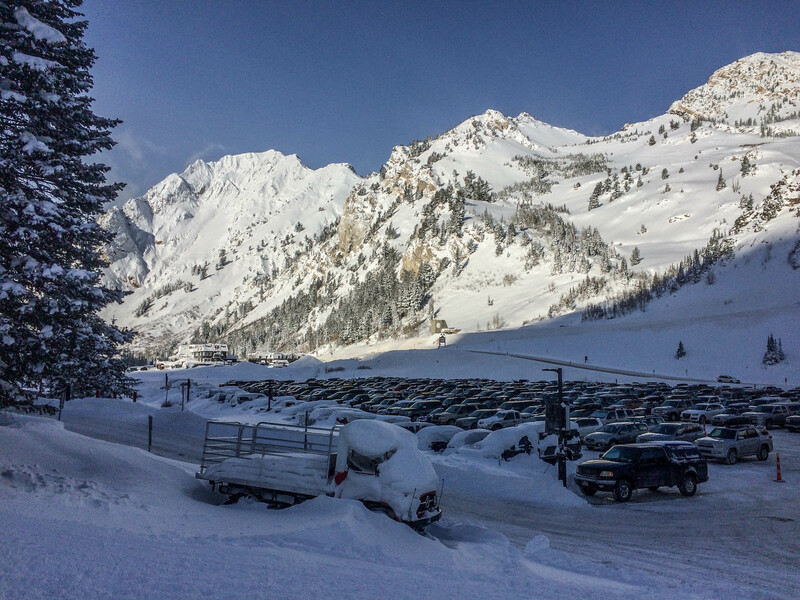 We recommend all SKIERS experience Alta at least once – sorry no snowboarders aloud. For expert skiers and riders, very few places anywhere can compete with the combination of huge quantities of high quality snow and steep rugged terrain that is found at Snowbird. Snowbird’s tram rockets visitors from the base, straight to its 11,000 foot summit where guests are treated to stunning views before they pick their decent from an endless menu of world class terrain. Lodging, dining, and other amenities are more abundant than at neighboring Alta, but it’s still mostly about the skiing and riding at Snowbird. Beginners and early intermediates will find a more limited set of options at Snowbird than Utah’s other resorts. We’re not trying to scare anyone away, it’s just not the best option to center your trip around if you’re less experienced. Brighton is a clear locals’ favorite due to its great down-to-earth family atmosphere. Most of Brighton’s terrain is moderate which makes it great for beginners and intermediates, but experts can certainly find a challenge. With almost as much snow as fabled Alta, and a MUCH cheaper lift ticket than the Park City resorts, the only ones who will be disappointed with your choice to go to Brighton will be the locals who want it all to themselves! Brighton is also you’re best option for night skiing. Its name says it all! If you’re looking to escape the crowds, Solitude is your best bet. To go along with its short to non-existent lift lines, Solitude has terrain options for all abilities and is blessed with an abundance of Utah’s top notch snow. We’re left scratching our heads as to why more people don’t visit to this resort, but for the few who do, that’s the best part! We’ve been seeing more interest in Snowbasin in recent years and deservedly so. This still mostly locals’ mountain is every bit as good as its more well-known counterparts. It has lots of terrain for all abilities, primarily high speed lifts and gondolas, long runs, a welcoming family atmosphere, and spectacular on-mountain facilities. In fact, we think Snowbasin’s day lodges are even nicer than Deer Valley’s! This lesser known gem is located north of the cluster of more prominent Utah resorts and is about 10-15 minutes further from the airport, but the slightly longer drive time is well worth it. Another aptly named resort, Powder Mountain is a bit out of the way but well worth checking out. It is best known for its ability to serve up untracked powder turns DAYS after a storm in contrast to the major resorts which are often tracked out by noon. This is due to low crowds and an enormous amount of skiable terrain. In addition to traditional lifts, Powder’s extensive acreage can be accessed by snow cat rides and busses that pick you up when you ski off the back into “Powder Country”. This unique resort has a no-frills throwback feel that provides a truly unique experience. Most of its terrain is fairly moderate, so it is a good place for all abilities and those looking to get their feet wet powder skiing.